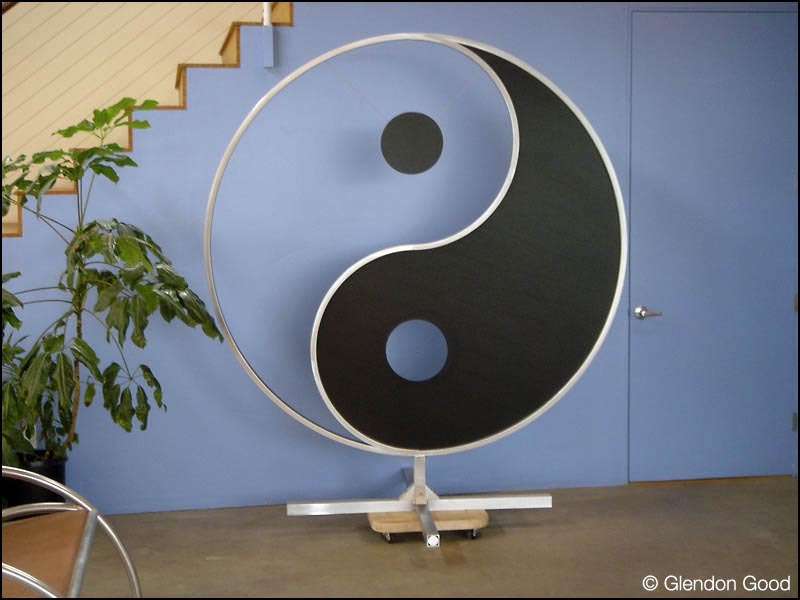 Industrial artist, Glendon Good, created this large, yet elegantly simple Yin Yang sculpture using anodized aluminum and rolled aluminum tubing. I love how the “white” sections are cut out so they take on, or adapt to, whatever is behind it. And look how smooth and sleek the black sections appear. Beautiful! In Chinese philosophy, yin and yang … describes how opposite or contrary forces are actually complementary, interconnected, and interdependent in the natural world, and how they give rise to each other as they interrelate to one another. Many tangible dualities (such as light and dark, fire and water, expanding and contracting) are thought of as physical manifestations of the duality symbolized by yin and yang. Glendon Good is a master craftsman with a passion for creating high quality products. … He infuses a dedication to fine craftsmanship and aesthetic sensitivity into everything he creates. Glendon is best known for his work combining non-ferrous metals (primarily aluminum and copper) with other materials to create custom projects for architects, designers and inventors. Glendon’s beautiful sculpture reminds us of the elegance of simplicity, that less can be more.